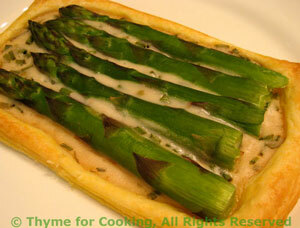 Asparagus Pastries, Tarragon Cream, Thyme for Cooking gourmet starters. Whole asparagus spears nestled on a bed of Tarragon Cream; a savory version of the sweet pastries in the windows of fancy Paris shops. If white use vegetable peeler and peel bottom half of stalk, laying it flat on the counter to prevent breaking. Cut to 4in (10cm) lengths, from tip. Reserved ends for another use. Bring 1 - 2 inches (5cm) of water to a boil in a skillet large enough to hold the asparagus in one layer. Add the asparagus and blanch for 2 - 4 minutes, depending on thickness. Mine were as thick as my index finger and I did 4 minutes. Heat wine, stock and tarragon in a small saucepan. Dissolve cornstarch in 1 tbs of water. When wine is boiling add cornstarch mixture and stir to thicken. It should be very thick. Lay out puff pastry and cut 2 rectangles, each the size of half of the asparagus laid flat with 1/2 - 3/4 inch (2cm) all around - or trim the asparagus to fit. Lay the cut pastry on a baking sheet. With a butter knife lightly score a line around the pastry, 1/3" (1cm) from edge. Divide the Tarragon Cream evenly and spread on the pastry, up to the line. Lay the asparagus on top of the cream - it should just cover it. Bake in pre-heated oven at 420F (205C) for 10 - 13 minutes, until sides of pastry have puffed around middle and are golden brown.